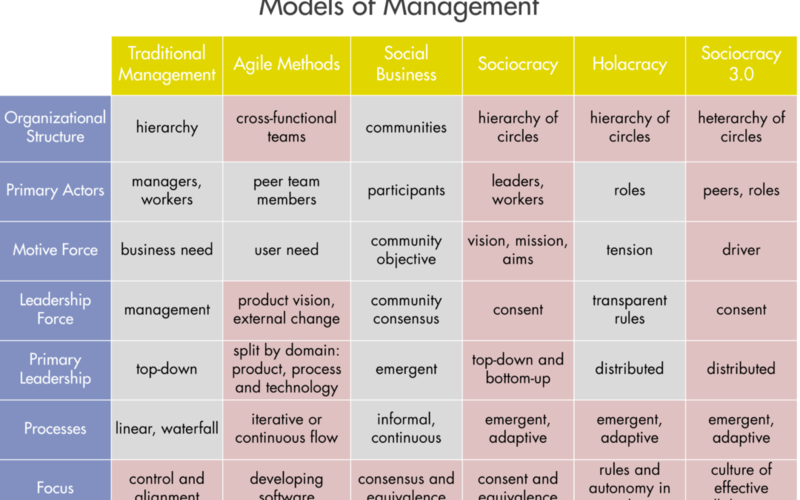 A while ago I stumbled upon Don Hinchcliffe’s “Comparing Various Models of Management with Holacracy” and found it curious he’d left out sociocracy. 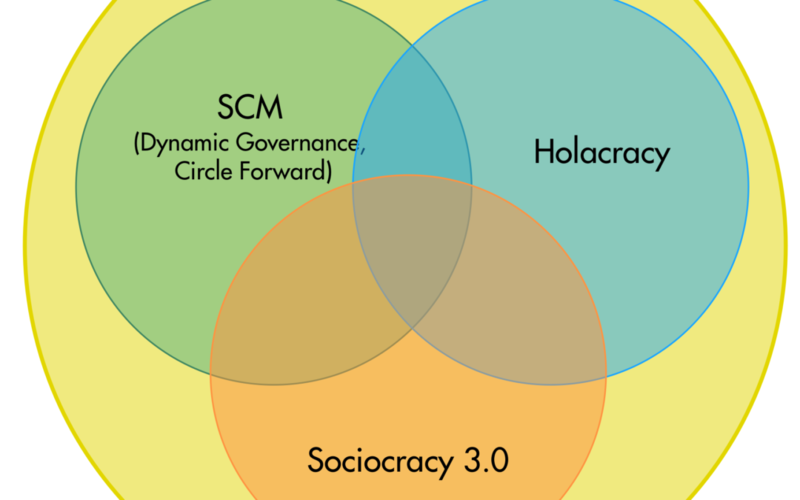 I assume he’s not even aware that Holacracy started out as a mere copy of Sociocracy, so I decided to fill in the blanks, and add both Sociocracy and Sociocracy 3.0 to the picture. My additions and changes are highlighted in red. Consent is reached if, and only if, each and every member of a circle, after understanding the problem and thinking through the proposal in all its detail and implications, honestly states that they currently see no objection against implementing the proposal. Everything else is not consent. It’s not consent if somebody could not be bothered to prepare for the meeting and read the proposal. It’s not consent if someone after an exhausting meeting simply does not care and says “I have no objection” just to get it over with. It’s not consent if somebody misunderstood the problem, or (part of) the proposal. The consequence of no consent is no agreement. No agreement is fine as long as there’s a shared understanding that there’s no agreement. Thinking we have an agreement, when in fact we don’t, is dangerous. We may be tempted to believe that this just a problem for the individual: even if they misunderstood the proposal, they still have to adhere to the agreement. In fact, however, this is a massive risk for the whole circle: Without consent, we have not used all the knowledge available to determine that the proposal is good enough for now and safe enough to try. In other words, the proposal may very well be not be good enough, or not safe enough to try. Understanding this will change our paradigm: For an organization to build a solid culture of “informed” consent it requires a lot more than just sticking to the meeting format and holding each individual accountable for their consent. We now hold everyone accountable for us all understanding that everyones consent is essential. For supporting each other to make sure there is consent, for watching out for each other, and creating a space where it is possible for each and every one of us to engage with each and every decision. Again and again, every time we make an agreement. This is why we love proposal forming so much, it gives everyone the space and time to engage with a problem. The chances that we all understand a proposal we co-created are just so much higher. This is also why the tuners need to be aware of the rest of the group while tuning a proposal: the amount of creativity they can bring into the proposal when bridging ideas or adding new ones is limited to what the rest of the circle can consume and still achieve consent. 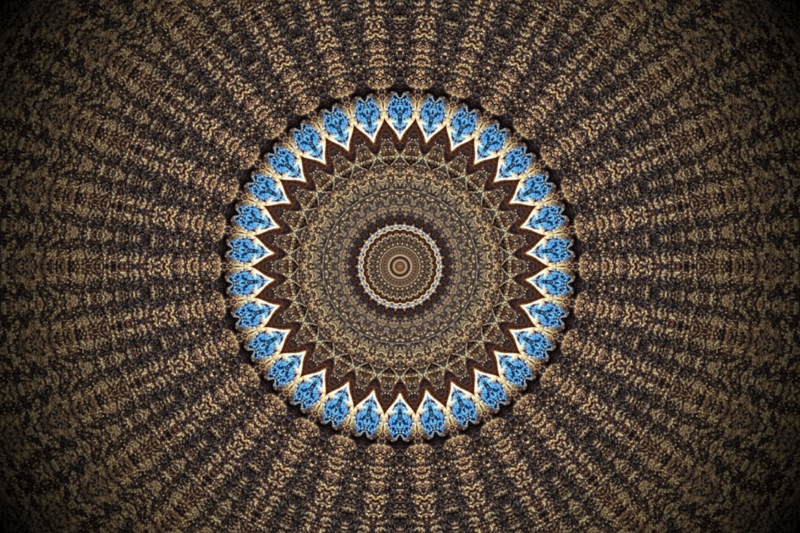 With every circle, this changes over time, so we need to constantly watch it. 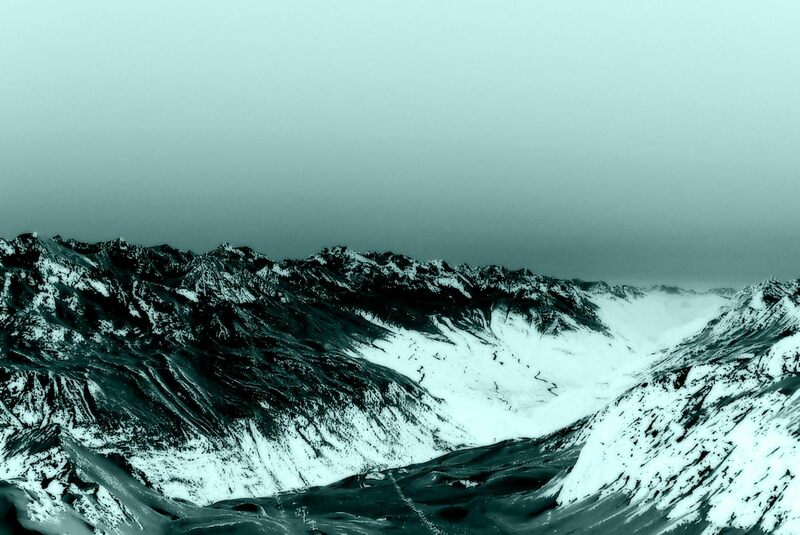 So sometimes you might say, “I have a concern: I do not think this is good enough for now and safe enough to try, because I’m afraid that some of us did not understand the proposal.” And if that happens over and over again, there’s a tension to be processed. Sociocracy – capital or lowercase ‘s’? 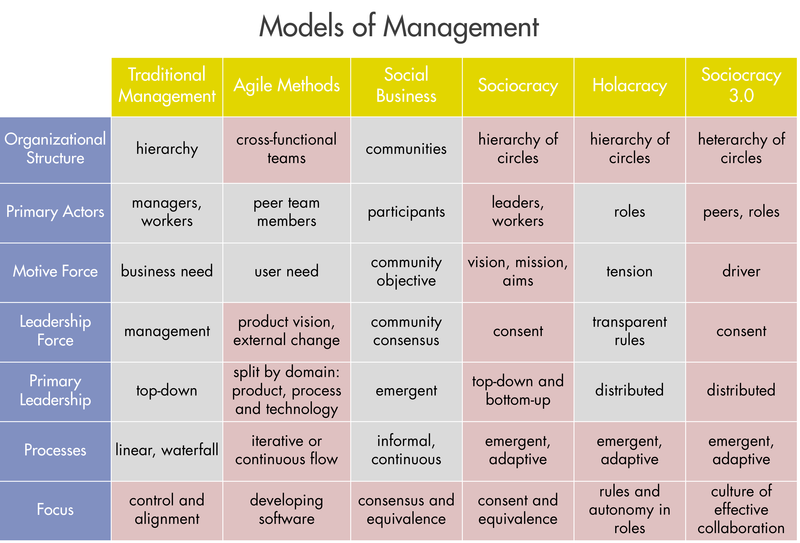 When I refer to “sociocracy” with a lowercase ‘s’, I refer to any system of running organizations where power (and decision making) is distributed to all members[^advocats of Holacracy would claim it’s roles and not people] of an organization through the principle of consent, and emergent knowledge is captured and integrated into working agreements[^policy] through objections. Also, I refer to organizations governed with such a system as “a sociocracy” (as we would refer to some countries as “a democracy”). 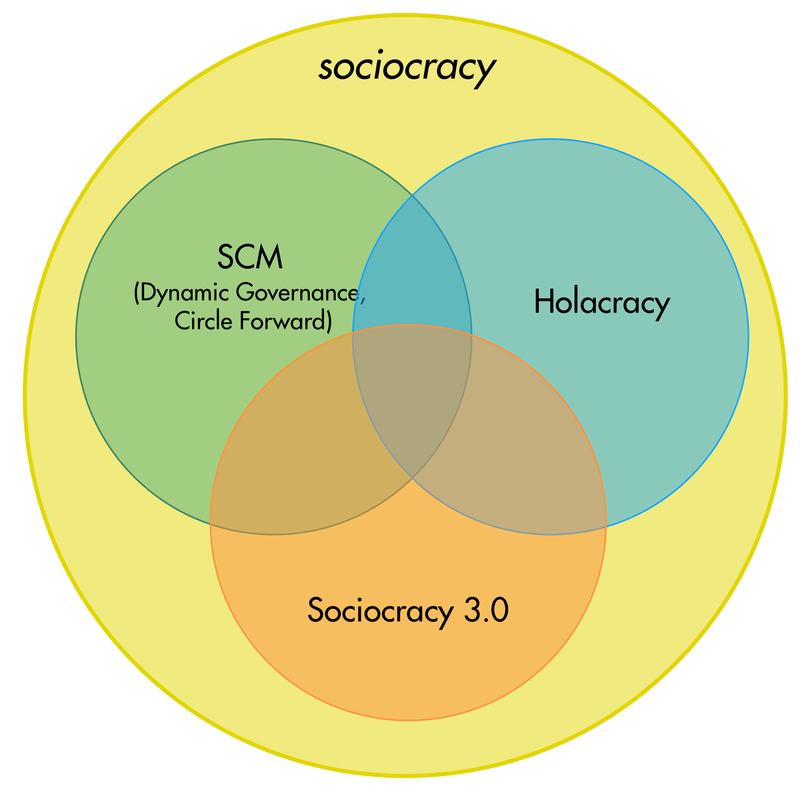 Sociocracy 3.0, developed from both SCM and Holacracy, and integrated with as well as other lean and agile methodologies, in order to make sociocracy (with a lowercase ‘s’) available to as many organizations as possible. S3 is stewarded by the S3 Working Group. It is a good thing we have a bit of diversity within sociocracy, because through that we can help many more organizations thrive. We could have a bit more exchange, but that is going to change soon. 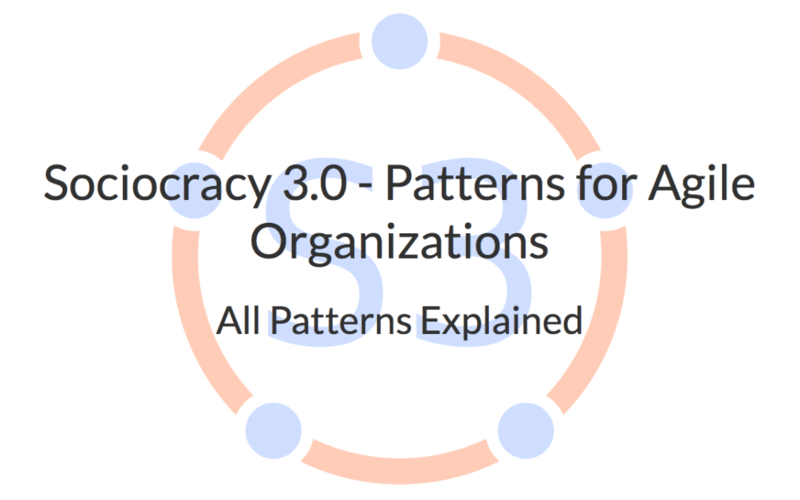 Sociocracy is a whole system approach for efficient governance, inclusive decision making, and the ongoing evaluation and improvement of an organisation. There’s many processes advertised as the path to organizational or individual enlightenment. But how can we find out if a process has a chance to fulfill that promise? I propose a simple framework to evaluate a process according to a few simple criteria, and a reality check at the end for good measure. I will then apply that framework to some popular processes. 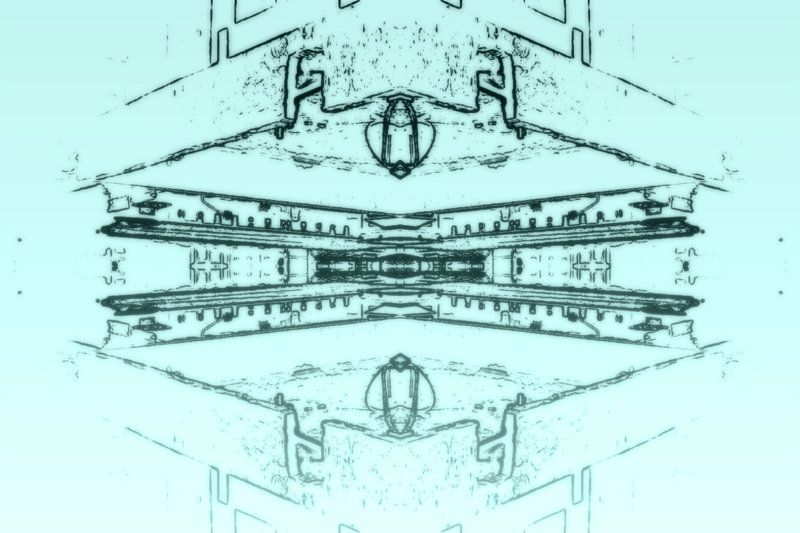 Complete: a good process contains all elements that are required to deliver its promise, not down to the level of minutiae, but good enough to leave no gaps. Lightweight: a good process is free of fluff, boiled down to the minimal set of practices that are necessary for creating value and learning about the principles that drive these practices. 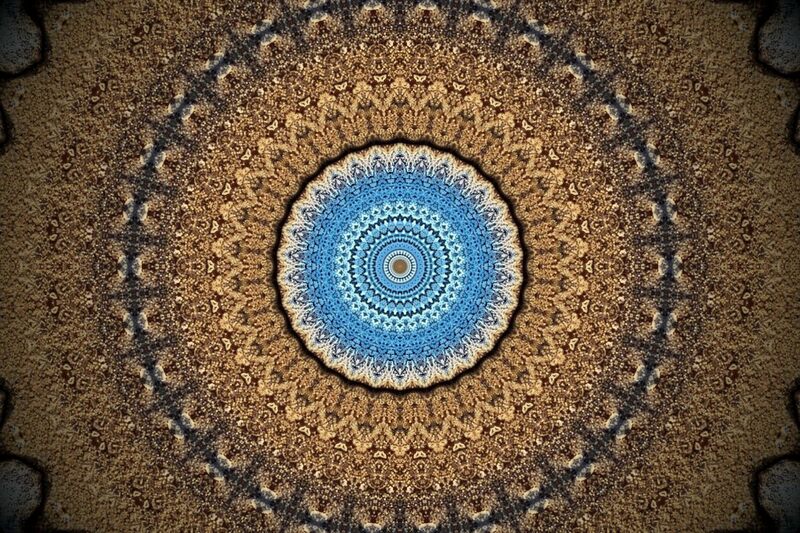 Transformational: applying the process allows us to experience something greater than we had before, something that opens new perspectives and new possibilities for growth. A good process is valuable from the start, but it grows on us as we continue to explore it. Our personal values do not only guide our behaviour, they also influence on our motivation and well-being through how the groups we are with respect and reflect our values. Most organizations or groups are not aware of the values they share, impeding effective collaboration and meaningful relationships between individuals with fruitless discussions that usually go nowhere and leave everyone exhausted.